vertically — up to 3 lines of text with a maximum of 11 characters per line. horizontally — up to 5 lines of text with a maximum of 6 characters per line. Please be sure to include the direction of the text and lower or upper case letters, in the box(es) below. Additional tags CDN $24 each. This large rectangle tag measures 11mm x 27mm and hangs from a 16" regular link chain or ball chain necklace. It can fit a name and date vertically (as showing in image #1) or up to 6 lines horizontally with a max of 6 lower case letters or 5 upper case letters per line (as showing in image #2). Please fill in additional information here. This large oval pendant measures 16mm x 20mm and hangs from a 16" regular or ball chain necklace. It can fit up to 3 lines of text with 8 upper case or 9 lower case letters per line. Please be sure to include your choice of upper or lower case letters. This large rectangle tag measures 14mm x 17mm and includes a 16" link or ball chain necklace. 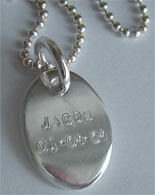 This tag can fit up to 3 lines of text with a maximum of 8 upper case letters or 9 lower case letters per line. Please indicate customizing in the box provided. 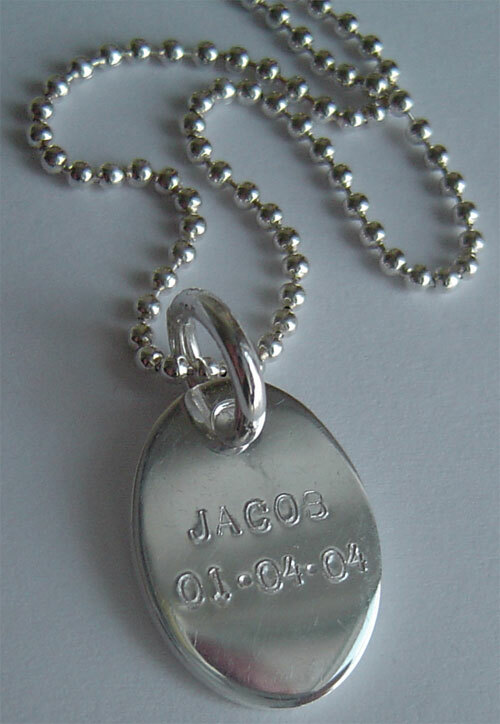 This necklace includes both a large square tag and a rectangle bar. The square can fit up to 3 lines with a maximum of 7 characters per line. The rectangle can fit 2 lines vertically with a maximum of 8 letters per line. Please indicate customizing for both tags in the boxes provided for each tag. Please see the A La Carte section for additional large square tags. Please indicate the customizing options for both the RECTANGLE TAG and the SQUARE TAG. If you need to leave additional comments or instructions, you may also leave a note in the comments box at checkout.